The Playing Field: There are two main grocery stores in Kandern: Penny and Hieber. Penny is more of a discount grocery store (similar to Aldi in the States). However, unlike Aldi, Penny offers a random assortment of special sale items each week. These can be anything from “Hello Kitty” pajamas, to chain saws, to cheese graters. Hieber, on the other hand, has a much bigger food selection and a wider variety of international brands and products. Yet, with this variety also comes higher prices! Weigh those Veggies: At Heiber, you have to weigh your fruit and vegetables before you check out. This can be confusing since we usually weigh produce at the check out counter in the US. If you forget to weigh your veggies, the sales clerk has to get up from their seat at the cash register, go all the way back to the produce area, and weigh your produce for you! As can be imagined, this can get a little embarrassing if you end up holding up an entire line of time-conscious German shoppers. Decisions, Decisions: Many of the German grocery stores (Penny more so than Hieber), don’t offer the product selection that we see in the US. If shopping at Penny, you probably won’t see fourty-five different types cereal, eight brands of ketchup, and fifteen different kinds of milk. Instead, there are usually two or three reasonable options. While this might sound limiting, it does make shopping a lot easier! On the flip side, if you are shopping at Hieber, you may find an overwhelming selection of products that you would never suspect to see in the US. For example, there is an entire aisle devoted to jam. Though I don’t have an official count, I am guessing that Hieber offers well over forty different jam varieties. Hieber is also crazy about their müsli selection—raisins, sunflower seeds, chocolate, dried fruit, almonds, crunchy, chewy, healthy, organic, for kids, flax, millet, and the list is never ending! But, to the German’s credit, the Müsli here is really good! Going Green: Don’t come to the grocery store without your own bag! 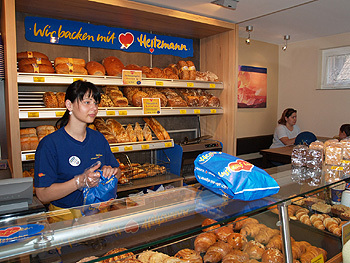 In Kandern, people typically use reusable canvas shopping bags. You could request plastic at the checkout line, but you would have to pay an extra 5 cents per bag…not to mention a few glares for your wasteful ways. Who says we need a canvas bag? We have a laundry basket! Less is More: In Europe, you typically don’t buy as many groceries as you do in the States. The reason is very simple, you just don’t have the room! The refrigerators here are much smaller, especially when you are sharing with seven other girls! Eat Fresh: It seems that food here goes bad a little faster than it does in America. There is much less use of pre-packaged/boxed food and preservatives. (yay!) So, be sure to eat your food quickly, otherwise, watch out for mold! Scrambled Eggs: Looking for eggs? Don’t check the refrigerator aisle. German eggs are always left out on the shelf. At Hieber, you also have the option of individually selecting the eggs that you would like to purchase. You simply load your own carton right there in the store! You can also buy hard-boiled colored eggs at any time during the year, not just Easter! So this isn't actually the Heizmann in Kandern..but the inside looks similar! Well, I didn't see too many that were actually in the shape of bears, but they definitely have a huge selection of gummi candies!